2. Customize the cards with YOUR contact information. Space has been made at the bottom of each card to add your contact information. With the customized cards, the minimum order per card title = 50 cards. You may purchase the customized cards in lots of 50, 100, 250, 500, 1000+. Email Jennifer@AgeFriendlyBusiness.com for a quote for your personalized order. Click below for details of content for each rack card. We hear about the scam artists and the fraudsters on a regular basis – and now you can make a real difference by letting your community know how to protect themselves. When you take steps to help your clients, customers, family, friends and neighbors, they will benefit ans will also be eternally grateful to you because you cared about them! Unfortunately, the scammers don’t care who they hurt, and will often try to target our older population. 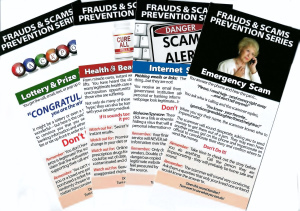 Sadly, this market are often hit harder, and have less time to recover financially from these types of scams. But, with a little education, everyone, especially our older citizens will find strength in their awareness to avoid these threats. 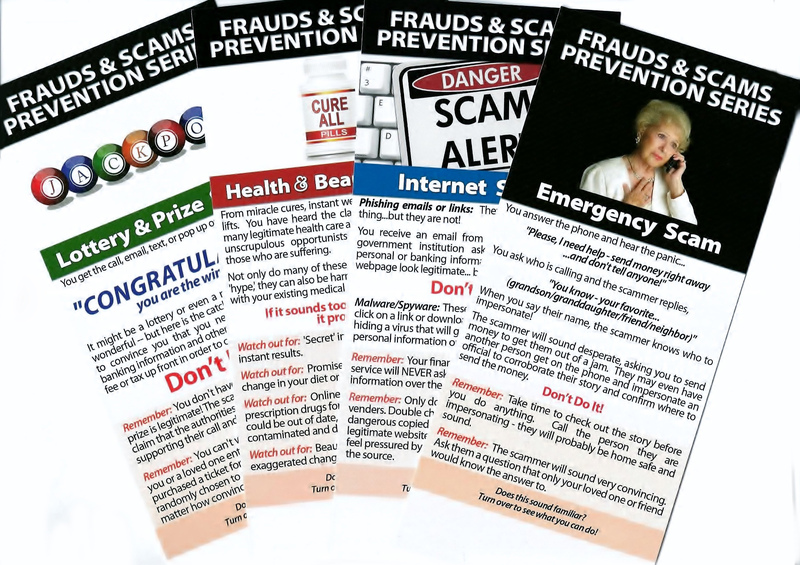 These ‘rack cards’ explain how the scams work, how to avoid them, and what to do if this happens to someone you know. All you have to do now is to make these cards available to your clients and prospects.